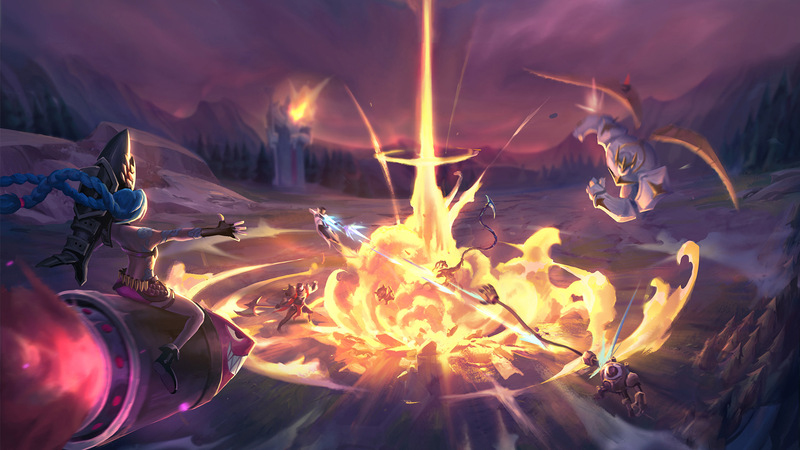 During the summer of 2018, we launched the Nexus Blitz alpha as the first “experimental game mode,” a new development approach where we start live testing of a game mode very early in development to help us determine if we should continue working on it. Based on the feedback we got during that first window, we decided to bring it back for a second, longer test run during Snowdown with a huge set of changes. After seeing how players engaged while Nexus Blitz was live, we’ve decided not to make it permanent at this time. It remains a great mode to occasionally bring back in the future, especially when paired with an event, but players just weren’t playing it enough by the end of the run to keep it always turned on. We know this news might disappoint some Nexus Blitz mains, but the experiment of making it with the League community taught us a lot about what you value, and the lessons from Nexus Blitz will help us make our future modes even more resonant and broadly appealing. We structured this live window of Nexus Blitz to have two phases: The first four weeks took place during Snowdown as the central “special event” mode, and the last two weeks were a standalone experience. We changed the map a bunch, added new content, introduced bans, and brought in a huge list of other improvements. You can find the full changelist here. At launch and during Snowdown, people played a ton of Nexus Blitz! There was a huge surge of players that queued up to experience all the changes, and total hours played in the first four weeks of the second run were double that of the first—that’s CRAZY. With the exception of the URF modes, Nexus Blitz had the highest engagement from players on an alternate game mode. People really loved the new content added for this run—Prize Fight and URF Deathmatch were the favorite events by a mile, and the Battle Sled was the most loved reward from the list based on player surveys. Many of the other big changes like the updated map art, addition of bans, and forecast of which event was coming up were also broadly well-received. The quiet powerhouse, though, was the addition of the Nexus Blitz missions and the mode’s tie-in with Snowdown. We saw huge interest in the Nexus Blitz missions, mode-exclusive unlockable cosmetics, and the Snowdown missions to earn tokens. But when Snowdown ended and the missions turned off for the last two weeks of the run, we saw a huge portion of Nexus Blitz players immediately go back to their usual modes. There was a significant drop in hours played per day, and engagement continued to decline for the rest of the run. All this tells us that Nexus Blitz is at its best when it’s closely tied into an event. Most players wanted to check out the new, crazy, “wait, that happened in League? ?” moments, but the novelty of those experiences eventually faded. The big reason people came back consistently was because they had goals to work towards in the form of earnable cosmetics, mission completion, and tokens. Once they had achieved those goals, the vast majority of players preferred to switch back to their usual modes. Ideally the experimental mode that we make permanent will be able to draw people in over and over again, even after that first burst of novelty wears off and there isn’t an event going on. As we think about future experimental modes, we’ll be reflecting on the lessons learned here and using that knowledge to create a long-lasting experience that can repeatedly serve players. Excitingly enough, we’re already using some of these learnings in other modes. Recently, we brought the Catapult of Champions to ARURF+ so players don’t have to always take Teleport, and we also applied the Nexus Blitz balance approach to both ARURF+ and the ARAM event mode. While we’re no longer considering Nexus Blitz as a permanent mode for the foreseeable future, we are going to treat it as a great mode to accompany events, especially given its flexibility to feature new in-game events and rewards. We’re already starting to think about when it could come back! I want to take a moment to give a sincere “thank you” to the League community. Thank you so much for jumping in, looking past the unpolished parts, and having a great time playing this experimental mode. We loved seeing all the clips of Battle Sled crashes, Bardle Royale Poppy ults, and clutch Prize Fight duels. As developers, it was amazing to get real feedback from the community so quickly, which only helped us to make more meaningful improvements to the mode right away. While we don’t have immediate plans, Nexus Blitz gained a lot from the “experimental modes” approach, and it’s a path we’ll consider for future prototypes. Thanks for helping us make a better (and blitzier) game mode! To commemorate some of the mayhem, here are some tidbits our data analysts shared about the mode! The Catapult of Champions was originally conceived of by Brian “Feral Pony” Feeney and is known as the FeeneyPult internally. It is also known as the Int-Pult, but it’s not as bad as the Int-Sled, which was by far the lowest win rate reward and the best way to lose a lead. It was also most players’ favorite reward. Despite having one of the highest win rates, Nasus had the lowest proportions of S grades and highest of D and C grades. Gotta get them stacks. The Arena event winner had the highest win rate of any event, finally proving that “2v2, 2v2, 1v1 me” is a valid way to determine the better team. About 1 in 5 games ended with Sudden Death Nexus-to-Nexus Combat. Maokai was played the most on Nexus Blitz in comparison to Summoner’s Rift. He was also probably winning the most compared to SR.
Akali was one of the top 20 most played champions, despite having the lowest win rate in the game mode (41%). The most purchased NB-exclusive item was Deathfire Grasp and the least purchased was Wriggle’s Lantern. Stat-Stick of Stoicism had the highest win rate (60%), but that’s mostly because only the people who were already winning could afford it. SpaceNorth manages the laboratory where we come up with new experimental modes like Nexus Blitz!